Did you see Bill McKibben's email about the massive day of action happening tomorrow against the Dakota Access Pipeline? When I was at the Sacred Stone Spirit Camp in North Dakota, it was incredibly powerful to see the coming together of over 200 tribes in this huge moment of resistance. And they aren't leaving until this pipeline is stopped for good! Right now is a critical time to show our solidarity. Last week, the Obama Administration paused construction on the pipeline, but the fight isn't over yet. Now we must make it clear that President Obama must stop it once and for all. Will you stand with Indigenous leaders against the Dakota Access Pipeline? In the last few days, over 100 solidarity events in 35 cities have been planned and thousands will be taking to the streets on Sept 13th. Join a solidarity action near where you live tomorrow. This is the moment for you to join us and support the water protectors who are fighting this pipeline. P.S. Can't make an action tomorrow? Check out other rolling solidarity actions happening all over the country during the next 2 weeks. For all of us who fight for a better world, it's been truly inspiring to witness the political organizing carried out these past weeks on the Standing Rock Sioux reservation. Their amazing work paid off in dramatic fashion yesterday afternoon. Minutes after a federal court refused to stop construction on the Dakota Access pipeline, the federal government announced that work would be stopping anyway: in effect, there was a people's injunction, won by the great courage and witness of tribes from across America. This is good news. They've bought time, and now it's our job to come to their support -- to turn this temporary halt into a permanent stop to the pipeline. And more, to make sure that nothing like this ever gets a federal permit again. That's why there will be solidarity actions across America on Tuesday, and we need you at one of them. The Obama administration announced months ago that new projects would now have to pass a climate test before being approved--we need that test applied to this pipeline. And we need to make sure than anything in Indian country never gets built again without full tribal consultation. 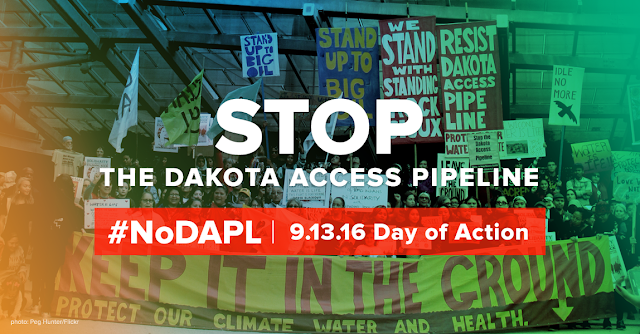 Let's make sure the President continues to feel the heat, and stops this pipeline for good: Attend a #nodapl action near you next week -- and if one doesn't exist yet, sign up to host an event on Sept 13th. These are some of the greatest organizers on the continent. We've fought side by side on the Keystone Pipeline and in a dozen other fights. And now we've got a chance to do something really special. After 500 years of being ignored by the federal government, native Americans forced something special today: serious recognition of their rights. That should give all of us real hope for the future.